Part Number ZOOMTAC-365. The ZOOMTAC-365 black light flashlight is an amazing tool. The lens can be pushed in and out changing the focus and diameter of the ultra violet energy. When you are in the market for a black light you want maximum effect from your UV light source. Most black light reactive materials use the long wave 365 NM wavelength. This UV light source has low apparent visible light noise. Giving the reactive surface a greater difference visually then using a higher wavelength. Now with that being said there are some materials that need 395 NM. But generally speaking the 365 NM wavelength ensures the fluorescent object, and not the surrounding surface, is illuminated perfectly. Risk Reactor Inc.’s 365 NM ultraviolet light produces a near pure black light output which is the best frequency for typical UV fluorescent applications. There are a lot of reasons why you want to use our UV LED technology. Money saving and Earth friendliness rank this technology a planet saver. Risk Reactor Inc.’s UV LEDs have a higher energy efficiency, longer lifetime, lower operating temperature than conventional UV lamps which create an intense amount of heat. Click here for the scorpion hunting black lights! 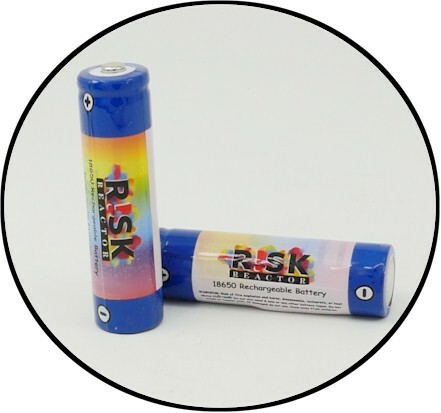 ZOOMTAC-365 Black Light UV Batteries. Rechargeable ZOOMTAC-365 Black Light Batteries. Forged document detection. * Bed bugs hotel rooms. Salmonella bacteria detection. * Car fluid leaks. Drivers license UV markings. * Fugitive glue applications. Dye penetration inspection (NDI/NDT). * Hand UV stamping inks. Magnetic surface analysis. * Kitchen inspections for cleanliness. Counterfeit currency detection. * Invisible pet stains on carpet and wood. UV Curing (requiring 365nm). *Invisible black light security inks and pens.